14 Prompts: Writing Prompts for Surprising Creativity is different. It starts with the question, how do you find more inspi­ra­tion and creativity right now? How do you dis­ci­pline your­self to write even when you’re busy? How do you learn to see the world like a writer even when you feel more like an amateur hack. As a busy father of three, I have a hard time finding time to write and feeling creative. This book is a reminder to myself, and writers everywhere, to open my eyes, be present, and remember every moment can be a source of fresh inspiration for my writing. 14 Prompts solves prob­lems that plague every writer. Readers have said again and again that it’s a per­fect blend between inspir­ing art and prac­ti­cal advice. If you fol­low these prompts, one per day, in two weeks you will be a bet­ter, more inspired writer. Get your copy of 14 Prompts: Writing Prompts for Surprising Creativity here. This eBook is meant to inspire you, teach you, and then set you loose to write some­thing remarkable. The writ­ing prompts and chap­ters are based off the best of The Write Practice, edited, expanded, and framed by a never-before-seen intro­duc­tion and conclusion. Joe Bunting is an author and the founder of The Write Practice, where he leads a community of creative writers and teaches courses on how to write books and get them published. He lives in Atlanta. 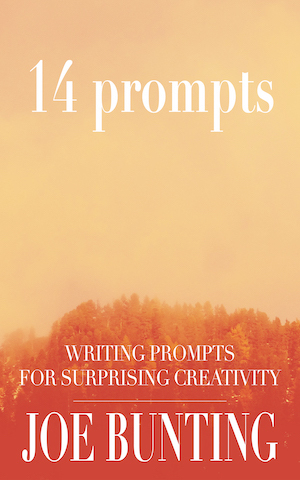 Click to get your copy of 14 Prompts: Writing Prompts for Surprising Creativity.